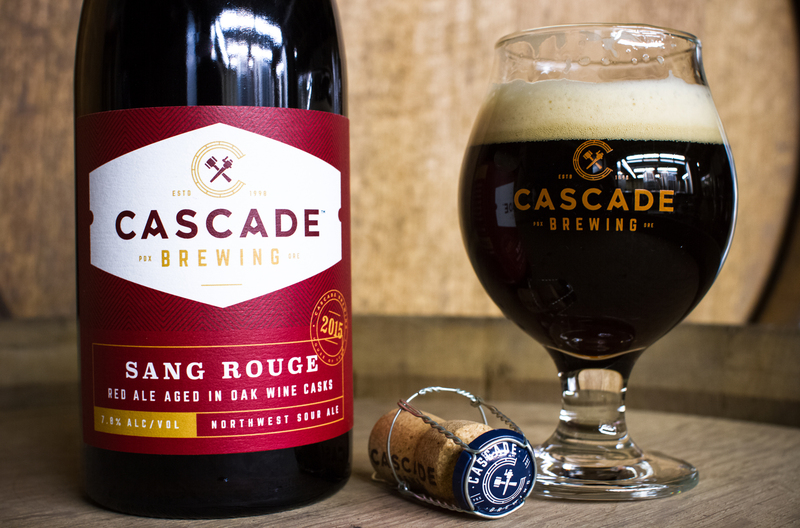 PORTLAND, Ore. – Jan. 12, 2018 – Cascade Brewing will release Sang Rouge 2015 today in 750ml bottles and on draft. It will be made available through Cascade Brewing’s worldwide distribution channels, as well as at its two Portland pubs: the Cascade Brewing Barrel House at 939 SE Belmont St. and The Lodge at Cascade Brewing at 7424 SW Beaverton-Hillsdale Hwy. Sang Rouge is a blend of sour red ales aged in select red wine barrels and oak puncheons for up to 24 months, highlighting the depth and complexity of Cascade’s base red ale without the influence of additional fruits or spices. This rare project features notes of roasted malts, dried currants, aged red wine and toasted oak. It’s ABV is 7.8 percent. Sang Rouge, which serves as the foundation of Cascade Brewing’s Sang series, was last released in March of 2015, nearly three years ago. The 2015 project designation is due to the fact that this beer has been aging in oak casks on average of 24 months, with some barrels exceeding 30 months. Sang Rouge is a Tier Two offering; Cascade’s bottles have distinct label styles for each of the three Cascade Brewing pricing tiers, with each label within the tier utilizing distinctive colors to clearly differentiate each beer. The tiers differ by the style of beer used in the product, the type ingredients contained within, the time aged in the barrels and types of barrels used. Cascade Brewing has been a pioneer in the sour beer renaissance since 2006 and the proud innovator of the Northwest Sour Ale. Its distinctive sour beer blends feature fruit forward, barrel-aged ales with an emphasis on project year-to-year variation. The beers offer a complex array of flavors derived from the acid, the fruit and the residual flavors present in the barrels in which they age; each project year captures the unique subtleties of that year’s growing season. Cascade Brewing’s sour ales are brewed and blended in Portland, Oregon. For more information, visit CascadeBrewing.com and join the brewery on social media @CascadeBrewing, #CascadeSours. Cheers to the sours; enjoy in a profoundly wise manner.